On Curmudgeon’s Corner this week, Sam and Ivan dissect the Comey hearings and related issues, but there is a lot more too! They cover the Reality Winner case, Qatar, the UK Elections, WWDC, the lottery, Sam’s new couch, and that isn’t even all! 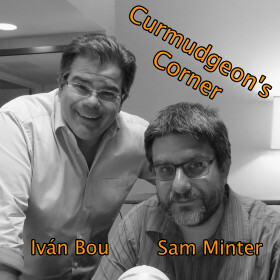 On this week’s Curmudgeon’s Corner Sam and Ivan spend most of their time on all of the events surrounding Donald Trump firing James Comey. That really is enough for a whole show! But they also talk a bit about bitcoin, Wiki of the Day, the travel ban court cases, and they respond to a listener’s comments on the healthcare debate. Then Sam’s son Alex comes to shut down the show. We’ve almost made it! Election 2016 is finally here. In this last episode before the actual votes are tallied, Sam and Ivan start out with some updates from the Republicans Sam interviewed in May and some feedback from a listener, then jump into the campaign events of the last week, before finally discussing faithless electors and final thoughts on what is likely to happen when the votes are counted. This is it folks. We’ve made it to the end. Almost.